Alan Reynolds made three changes from the draw with Bohemians; Maxim Kouogun, Kevin Lynch and Aaron Drinan replaced Kenny Browne, Georgie Poynton and Cory Galvin. 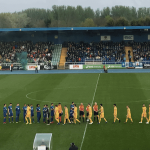 The Blues started brightly with Shane Duggan and Izzy Akinade pressing the home defence but a couple of decent crossing opportunities proved fruitless. Jamie McGrath headed wide before Patrick Hoban made no mistake after eight minutes to score the opener. 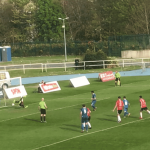 With two balls on the pitch as Sean Murray crossed, referee Robert Harvey played on as Patrick Hoban headed beyond the stranded Hugo Keto who looked to anticipate the crossed ball. Dundalk took control and almost doubled the lead midway through the first half. Sean Gannon played in Daniel Kelly but Blues captain Damien Delaney did well to make a vital block. Alan Reynolds’ side came back into the game again and Zack Elbouzedi had a good chance just past the half hour but Gary Rogers got down well to make a good save. The best Blues move of the half arrived after 36 minutes. JJ Lunney found the overlapping run of Kevin Lynch and he pulled the ball back for Aaron Drinan but he scuffed his strike. Straight down the other end and it was 2-0. Maxim Kouogun failed to get enough on his clearance from Jordan Flores’ cross and Sean Murray was on hand to fire low past Keto. The Blues started well after the break and Aaron Drinan went close five minutes into the second half. The on-loan striker made space just inside the area and forced Rogers’ into a very good low save. Seconds later, Kouogun headed just wide from Elbouzedi’s curling cross. But Dundalk put the game beyond doubt on 57 minutes. Jamie McGrath’s touch found Daniel Kelly and he made it 3-0. Scott Twine’s cross with 20 minutes remaining forced a last-gasp clearance and a Blues corner. Kevin Lynch’s corner wasn’t cleared and found Delaney but he couldn’t find the target from a tight angle. Twine was again looking to find the breakthrough with seven minutes left on the clock but his strike was straight at Rogers in the Dundalk goal. Brian Gartland hit the post as Dundalk looked for a 4th; and that duly arrived in the final minute as Cameron Dummigan took advantage of poor defending in the Blues penalty area.